Where better to do x-rays? Radiography of the paranasal sinuses (LTP) is a valuable and indispensable diagnostic method in medicine. It can be performed in almost any medical facility having the x-ray machine. The accessibility and simplicity of execution this picture was x-rayed and the VPI key in the detection of inflammatory and traumatic diseases. The most often reason given for radiography of the sinuses is suspected inflammation (sinusitis, frontal sinusitis, etmoidit), also recommended in traumatic injuries of the facial bones, the diagnosis of tumors. To pass the examination will need specialist consultation (ENT doctor, maxillofacial surgeon). Based on the direction and diagnosis of the radiologist selects the proper position for x-ray diagnostics. 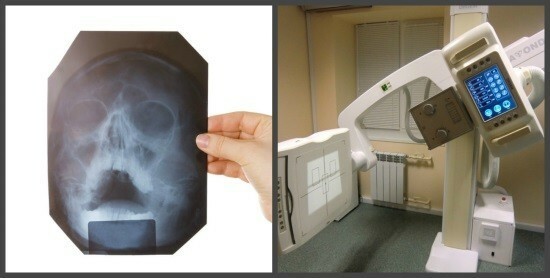 X-ray examination is indicated if one of the above complaints combined with high body temperature, deterioration of General condition, weakness, and fatigability. These signs indicate an inflammatory process in the cavity of the sinuses, especially if the history includes recently transferred acute respiratory disease. Also perform x-ray diagnostics for monitoring treatment. Radiography of the sinuses is appointed before the upcoming dental surgery in the pathology of the dentition of the upper jaw. It is sometimes recommended examination of neurological patients with persistent headaches in the frontotemporal region. Preliminary preparation for the research required. Enough to take off metal jewelry. Doing x-rays of the sinuses in a vertical position, the patient rests his chin on the stand, mouth open, you need to hold your breath at the command of the doctor. There is also a method of carrying out x-ray at the horizontal position of the patient, however, this laying is ill defined fluid inside of the sinus, especially if it’s a little. The duration of a scan on modern machines is five to ten seconds. Some time is required for the doctor-radiologist to decrypt the snapshot and compile the medical report. The first two positions have found the most wide application in medical practice. The lateral projection is used more for diagnosis, it sometimes replaces an x-ray of the nose in the diagnosis of traumatic injuries. The frontal is indicated for the detection of frontal sinusitis and ethmoiditis. The differential diagnosis between inflammatory and neoplastic process sometimes requires the additional introduction of radiopaque substances into the cavity of the maxillary sinus. For this purpose, contrasting agents, for example, yodolipola or verografin. Use about 5 ml of contrast after local anesthesia injected into the sinus cavity. Then do x-rays. The contrast material is independently derived from the cavity approximately one day. More complex is the technique of contrasting the frontal sinuses, because the drug is inserted through the fronto-nasal fistula. Currently, x-ray of the sinuses with contrast sinuses is often. He gave way to a more modern and informative methods – computer, magnetic resonance imaging. Normal paranasal sinuses have a clear bone contours, their cavity is not defined by any pathological inclusions. Pneumatization should meet of the eye sockets. 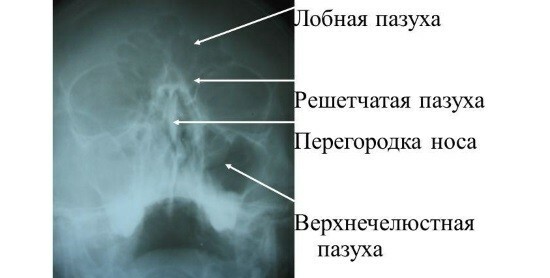 Inflammation on radiographs thickening of the mucosa of the paranasal sinuses, the cavity is defined by the presence of fluid, depending on the stage of the process it has horizontal or concave oblique level. Long flowing inflammatory disease characterized by thickening (hypertrophy) of the mucosa, which in the picture is defined as the wall shade. In more complex cases, is lost air sinuses, it is completely obliteriruty. 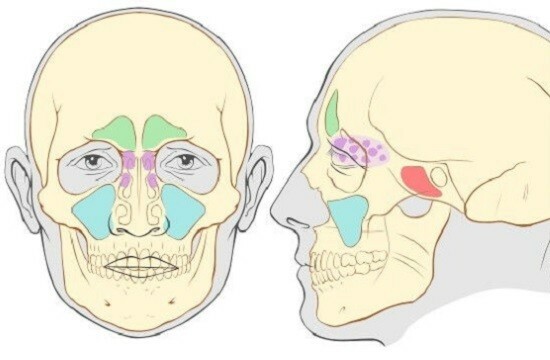 Traumatic injuries are visualized fractures, fractures of facial bones. Also identify bone fragments or splinters, the degree of displacement. On the radiograph clearly enough to identify both as bulk and cavity (cyst) tumors in the maxillary sinuses. However, in an x-ray is not always possible to determine the exact nature of the process, the degree of malignancy of the tumor. To clarify the diagnosis in such cases, recommend CT or MRI. Grounds for refusal of x-rays not so much. Do not conduct a survey of pregnant women and children under the age of 15 years. Contrast is contraindicated in patients with allergic reactions to iodine, breastfeeding women, the presence of epistaxis. Children under 15 years showing others allowed them a safe technique such as ultrasound or endoscopy. In difficult clinical situations, MRI is recommended. Child x-ray of the sinuses is performed only on strict indications: suspected purulent process in the sinuses, traumatic injuries of facial bones. The state, as well as most private health institutions have in their Arsenal of x-ray unit. So go through the x-ray of the paranasal sinuses is not difficult. Enough direction from the attending physician, indicating the provisional diagnosis and the study area. It is also advisable to bring a patient card or medical history. Medical documents need a doctor-radiologist in deciphering x-ray. READ How to scan x-ray: is it possible in the scanner? Radiation exposure from x-rays PPN is 0.05 mSv. Many people wonder: how often can do an x-ray of the paranasal sinuses? Do it as many times per year as necessary for treatment, children up to 15 years, often replacing ultrasound. Better to give preference to hospitals that have the digital x-ray machine. In this survey there is no significant radiation exposure. Methods to more accurately differentiate pathology in the photo are CT and MRI. They do not apply to routine studies and are conducted only under strict indications. Indications for these tests are identified tumors, the upcoming surgery, chronic inflammatory process, poorly amenable to medical therapy. Children older than five years, it is preferable to MRI because in this case there is no radiation exposure, and diagnostics informativeness is quite high. 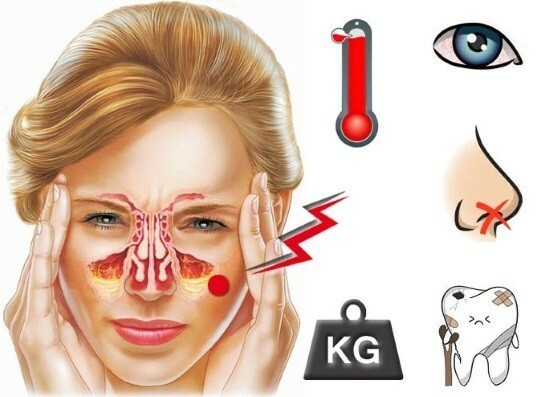 In a clinic can be carried out ultrasound examination, it is well to visualize the inflammatory pathology, can be used to monitor the treatment of sinusitis. However, ULTRASOUND examination can diagnose a bad bone changes. Endoscopy is indicated for suspected neoplasm, and often associated with surgical procedures, so is done only under strict indications. 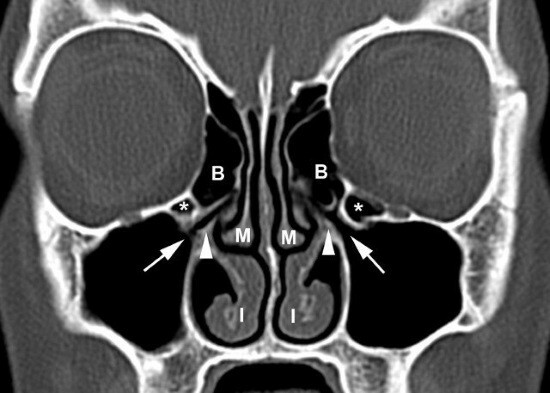 MRI of the paranasal sinuses: what shows? X-rays of the maxillary sinuses: what does the?